LONDON (AP) — All police found at the bottom of a cliff was a man's body in a frigid river and a Segway, the two-wheeled electric device that was supposed to revolutionize personal transport. 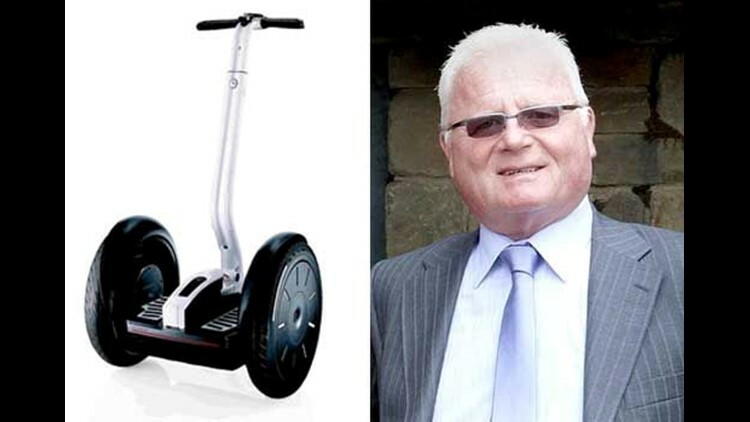 Details remained sketchy — police say only that the death was not suspicious, meaning foul play is not suspected — but the incident seems certain to raise fresh questions about the safety of the Segway, which is banned on British motorways and in some U.S. cities because of safety concerns. Somber family members visited the accident site Monday — placing wreaths — but they asked for privacy. President George W. Bush famously tried one out in 2003 at his family's estate in Maine, but the machine toppled over when he tried to get on it. Celebrity journalist Piers Morgan also took a tumble on one — the video can be seen on YouTube, along with dozens of other Segway mishaps.